With a repertoire from 60's pop to 70's/80's retro to top 40 hits of today, and many great classics along the way, "MONKEY BUSINESS" delivers a mixed bag of songs that is sure to please any party goer. 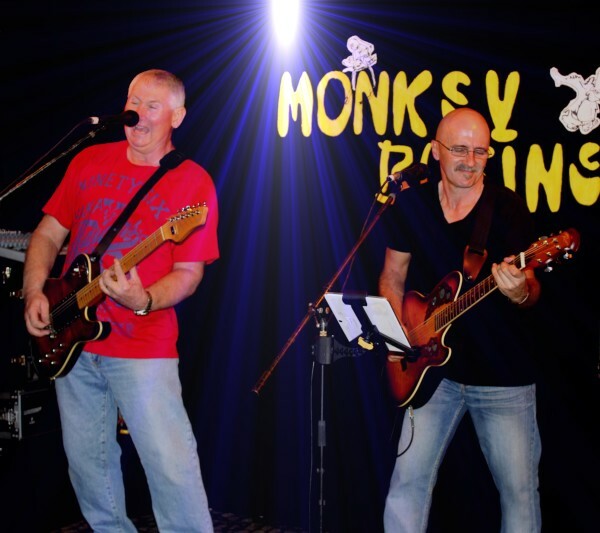 "MONKEY BUSINESS " are building a dedicated group of patrons that support their shows at a lot of their regular gigs around the Illawarra and South Coast; and they never fail to recruit new blood at any new venues. Why? Rob Wales - has just about done it all from hard rock as a guitar player in pubs and clubs to being the front man in an Aussie bush band in Disneyland. As a more than competent Solo artist, Rob's great guitar work lends itself to a performance which rivals most 4 and 5 piece bands. David De Rosa - has been entertaining crowds from the age of 18. From small Pubs to Large Concert venues, David has played them all. Good honest Rock & Roll is his passion & nothing pleases him more than seeing a crowd up on the dance floor enjoying themselves. Working together Monkey Business have made a connection, and developed a hot duo that has something for everyone, and is in big demand!! !